When a visitor lands on your website they have a specific task in mind. They need information and want it quickly and easily. 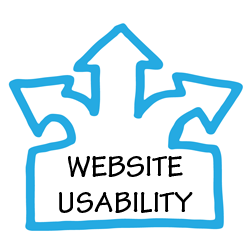 If Content is King, then usability is Queen! Surveys have proven that the most important factor for a user visiting a website is the ease of finding the information they need. If they have to dig and search for the content they are looking for the next step is to look somewhere else. How does your website stack up? One of the biggest challenges our clients face initially is breaking their readers into discrete audience segments. But this work is essential in understanding how to organize content based on your readers’ needs rather than their own. Do you know how many of your visitors are using mobile devices to access your website? Many sites have a third or more visitors using tablets or phones rather than desktop or laptop computers. Mobile visitors expect and should have as positive an experience as desktop users. This is, of course, subjective with your visitors rather than you being the final arbiter of what is or isn’t user-friendly. The key to building a user-friendly experience is through planning and testing. Focusing on the content, functionality and structure will build the groundwork for a successful website, now and in the future. Successful websites help their customers obtain the information they are looking for, offer a product they need or help them resolve a problem. If you can address that immediately then you have done your job. Figuring all this out on your own may seem daunting. At Westchester Marketing Cafe we are experts in breaking down and dissecting your content and website to develop a strategy that works best for you and your users. Give us a call 914-502-0634 to discuss how we can put together a user-friendly strategy for you!